Vast numbers of jellyfish have been invading British beaches this summer, to the consternation of tourists and local people. Perhaps we should just find out which species are edible, and learn how to eat them? 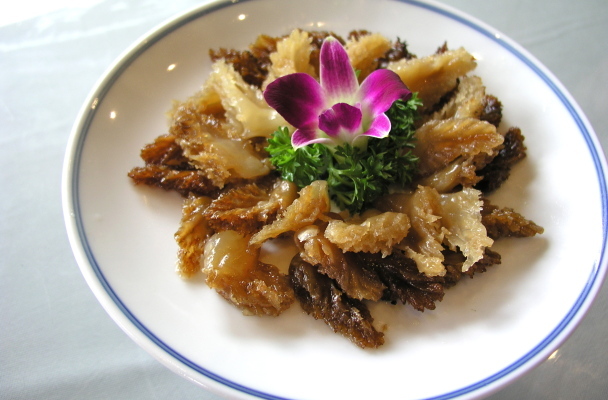 The photograph shows a snappy little starter made from the oral arms of jellyfish (known in Chinese as ‘jellyfish head’ 海蜇头), as served with a seasoning dip at the Dragon Well Manor in Hangzhou. The ‘jellyfish’ most commonly served in Chinese restaurants in the West is the umbrella-like top of the creature, which the Chinese refer to as its ‘skin’ (海蜇皮). I’ve always liked the idea of eating as a form of ecological control. Sadly, it’s hard the change people’s tastes in what they will or will not eat. For instance, the Asian carp and Burmese python problems in the United States can probably be controlled if the animals’ products can be monetized. But few people in the US want to eat these animals, with the reason of how they look “ugly” or “strange” being given as rather weak excuses. The same attitudes and reasons are given when jelly fish are proposed as food. The BBC host was being awfully polite in the interview, but his prejudice and visceral aversions still shone through. Imagine how cheap a source of dietary protein jelly fish could be if more people would eat it regularly. Still, the fact that most jellyfish is processed with alum (preserves crispness) makes its regular consumption a bit less appealing. Still, I look forwards to the day someone figures out how to cure jellyfish without alum. And when that day comes, I will gladly eat it everyday.